After the breakdown of a marriage, there are five ways to resolve financial, proprietary and child maintenance disputes: mediation, collaboration, direct negotiations, taking the case to court and, possibly least common, Arbitration. This is an article answering and explaining the most common questions asked by clients of Garner & Hancock LLP about the option of Arbitration. This is a form of dispute resolution in which parties appoint a fair, impartial and qualified third party – the Arbitrator – to determine an award (equivalent to a final judgement). 2.When can this option be used? To resolve financial, proprietary and child maintenance disputes following the breakdown of a marriage. This is not an option for disputes relating to child arrangement orders or divorce. Eradicates the need for costly and prolonged court processes, but unlike mediation ensures that an agreement will be arrived at and secures complete confidentiality. The process can be relatively instant in comparison to court proceedings as once an Arbitrator commits to dealing with the case, timetabling arrangements are down to what best suits both parties. It also removes the potential for further conflict and confrontation in an already sensitive time. 5.What are the costs involved? A fee is agreed between both parties and the Arbitrator which is often shared between the parties. The Arbitrator does however hold the power to make an order for one party to pay more than the equal share. It is decided whether fees will be paid either on an hourly, daily or fixed-fee basis. Additional fees include independent legal advice, venue hire – for any meetings arranged – and any expert fees that may be required during the process. 6.We have already begun court proceedings, is Arbitration still available to us? Yes, court proceedings can be adjourned for the matter to be resolved through Arbitration. Note that this will not prejudice the court proceedings. 7.Do I have to be represented by a solicitor or barrister? No, however it is strongly recommended to seek independent legal advice regardless of whether the parties want to be represented or not. 8.Which Arbitrator should I choose? It is entirely down to the parties. They can either submit a request for a particular Arbitrator by name or submit a shortlist with several names on leaving it to the IFLA to decide. Alternatively the parties can instruct the IFLA to choose an Arbitrator who deals with issues relevant to the case. 9.Can the Arbitration process be stopped once it has started? Yes – but only if both parties agree. One advantage of the process is that they can end it altogether or they can pause the process in order to try and reach an agreement. Unlike a court proceeding the parties can decide on certain problems and the Arbitrator only concludes issues where an agreement cannot be made. This issue by issue approach can be very cost saving as it can avoid the parties having to be hauled into court when only one issue is in dispute. 10.Does Arbitration fit in with mediation? Yes. Arbitration is exceptionally flexible in the sense that issues resolved in mediation are preserved while the disputes are decided upon by Arbitration. 11. Is the final decision binding? Yes. 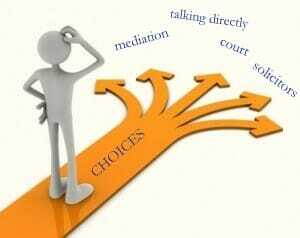 Unlike mediation, the decision of the Arbitrator is binding and fully enforceable. It must be considered in depth, and with independent legal advice, whether Family Arbitration is the most favourable and constructive way to deal with the state of affairs. If it is unlikely that many, if any, issues can be resolved between the parties, then this process could very easily be as costly and prolonged as a court proceeding. If numerous experts are needed to verify and analyse the issues then there is very little point in following up the Arbitration process. It does however seem to add a more personal feel to the proceedings after a marriage breakdown. In its most simplistic form, Arbitration is generally a quicker, more cost-effective, flexible and versatile option than court proceedings. It eliminates many of the formalities involved with court proceedings whilst maintaining confidentiality allowing the parties to stay in control of their affairs and decide which course of action is most appropriate and efficient. This would appear to be a practical alternative for marriage breakdowns in which there are either few contentious topics, specific issues that need addressing or where the parties are willing to co-operate to achieve the fairest resolution. At Garner & Hancock we can advise the best way to use arbitration in your case. Please telephone us to discuss your matter.